Off I-90, take exit 67B(Liberty Blvd) and continue to the 4-way stop. Continue straight thru the Main Gate. After passing through the gate entering traffic circle at 6 o'clock and exit 3 o'clock, the first exit which is Schreiver Street. Proceed approximately 4 blocks to Arnold. Turn right proceed across N. Ellsworth., becomes Lincoln Turn right at next (3 way) intersection onto the CG entrance road proceed past housing office to CG office. 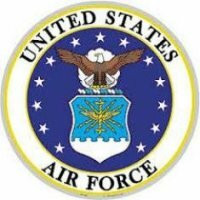 ---- Additional info on gates: Personal RVs are welcome to use any gate on Ellsworth AFB they choose, whether entering or exiting the installation. The Main Liberty Gate is open 24 hours a day, seven days a week. The "back gate" near the FamCamp is open Mon-Fri 0600-1800. Year round. No water in the winter. Reservations are accepted 1-year in advance. A 24 hours advanced notice is required for cancellation refund eligibility. Pets are welcome in designated area, which is located on the North fence line. Pets are required to on a leash and guests are responsible for picking up after their pet. 30 day stay limit. Lower rates are for low season (Nov 1 - April 30). Middle rates are for mid-season (May 1 0 June 31). Higher rates are for prime season (July 1 - Oct 30). 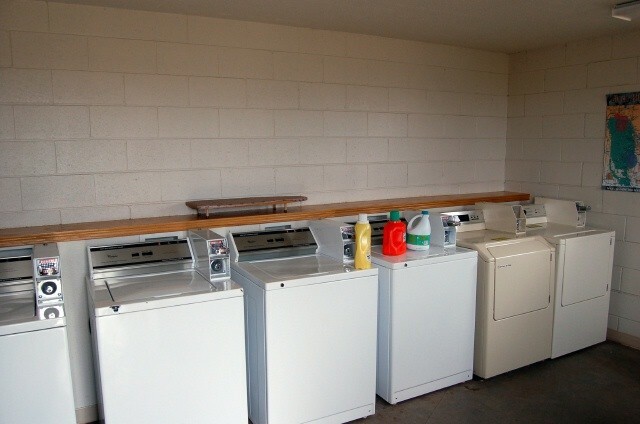 Overflow sites are available in the winter with no water, shower or laundry for $7 a night. Tent site is for up to 4 people. $5 per person for additional. Lodge rates vary based on the time of the year. Auto Hobby Shop, Arts & Crafts, Recreation Equipment Rental. Pool pass included with RV site. The location being so close to the Black Hills and Rapid City makes sightseeing trips fairly easy. The park was clean, the staff terrific, but (I know, there's always a 'but'...) the washers and dryers really need some attention, almost half on either side are always 'out of order'. The base saw fit to place brand new dumpsters in the park, when there wasn't anything wrong with the old ones, but you can't fix your washer/dryer problem? 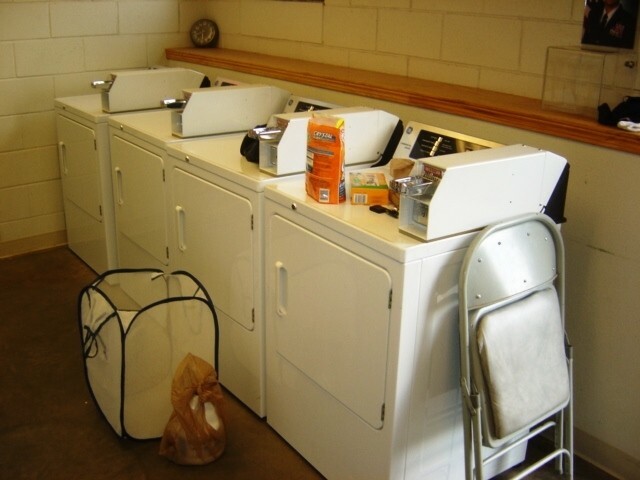 I shouldn't complain too much, as the laundry is free, but having said, that, I am remiss as to why the base felt it was more urgent to replace dumpsters than washers/dryers. Overall, I gave the park a 3.4 rating due to the laundry facility, TERRIBLE Wifi (I don't know how that previous rater could say it was 'excellent'; it was FAR from that! ), and a bit steep on the price. MWR used to charge based on rate/rank accordingly. Whatever happened to that system? Have stayed in a few military parks and this one was fantastic. Limited experience but have not stayed in a bad military park as all have been secure, accommodating, and friendly. 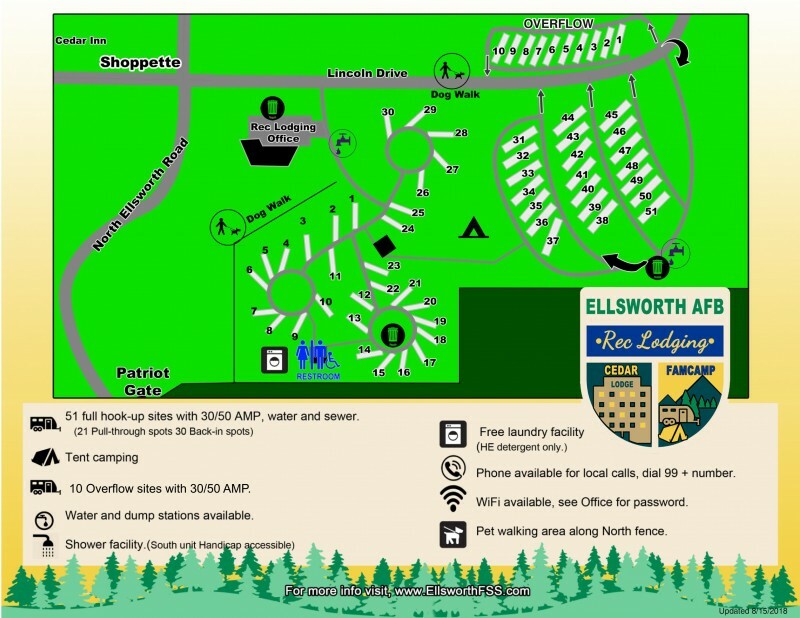 Ellsworth offered cement sites with easy hookups, excellent WIFI, and free laundry. Can't beat any of that. The weather however was foggy and cool which limited our vacation plans but certainly not any fault to Ellsworth AFB. BX and commissary within a mile or two. Will definitely come back to this park. Most modern I have seen. The directions sent to us by the campground office were “misleading” but office staff said they were in the process of resolving. The Patriot Gate ( open until 6 weekdays) is the best gate to come in. The campground is on your right soon after entry. There are two sections to the park. The older part is in “wagon wheels” with all back in sites. Our site was not long enought for our 5th wheel and truck and had a tree at the back of the site that blocked our back door. The newer section is all pull thru. All sites are concrete with a patio, table and grill. Free wi-fi ( sometime spotty). Our satellite worked fine and you can get quite a few OTA channels. Small but adequate commissery and exchange. Base gas station has diesel. Bowling alley ( but don’t eat at the snack bar), movie theater, golf course and a great air museum right outside of base. Not too many stores nearby but this is a great place to stay to visit all the sites in the surrounding area. No play ground for kids but plenty of grassy area for you dog to walk. They are in the process of adding some pull thru overflow sites across from the FamCamp. I thought the price was a little high but we did get one night free with staying a week. Also, if you are looking for a "day of” place to stay try to call during the business hours. They have a board in front of the office which every night it said “no vacancy”…..but there ere empty sites every night. The office staff said they don’t change it if they just have a few sites available. One of the nicest FamCamps we've stayed in. Quiet, clean, walking distance to shoppette, and there's a thrift shop on base with all sorts of treasures. Concrete pads, easy hookups, and nothing beats hearing reville in the morning! There is overflow area, or park in front of Dakota Club. Not far from Rapid City, and all the Black Hills attractions. Free Laundry. The grass will become 12" high before they mow it though, that's the only possible thing to fuss about with this campground. Wifi was passable, but not wonderful. Ellsworth is a wonderful campground. The office staff is extremely accommodating. It is in a great location to explore the Black Hills. There is a nice golf course just outside the gate and Ellsworth has a great gym. With the exception of the lawn, the facility is clean and well kept. 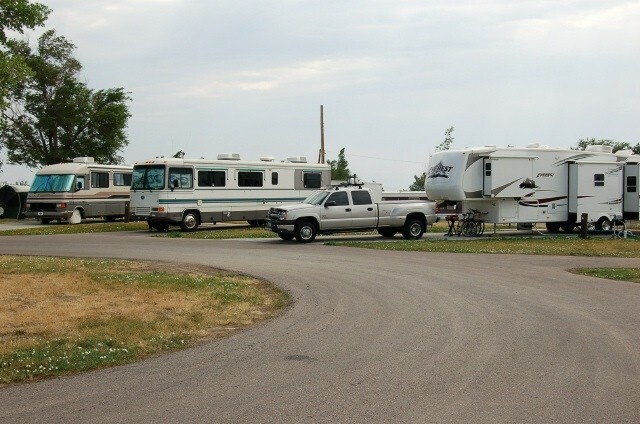 We were there just prior to Sturgis weekend, so the campground was full. Unfortunately 1/2 of the washing machines were not working and the grass needed to be mowed. Very nice park. The park is in a wagon wheel layout which gives each RV plenty of room. 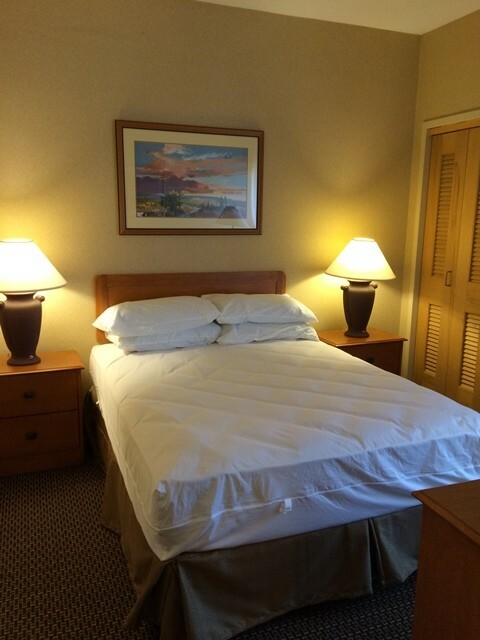 There is sun and shade, very clean restrooms and laundry rooms, and the grounds are kept up and mowed regularly. The roads are paved and the pads are concrete. All utilities worked fine. The park is set near 2 of the base gates - convenient; and the base isn't so far out of town that it is inconvenient. Our only complaint was the wifi was too slow - we used our hotspot. Otherwise, very nice! Cant go wrong with this location. 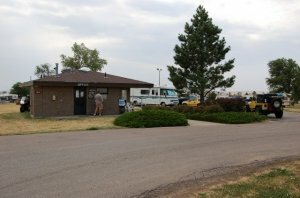 Clean facilities, great concrete RV pads and QUIET neighbors. Close to AAFES and the Commissary. Make sure and follow direction given when you make a reservation as GPS will take you right to the gate that is closed outside of business hours. Quick drive into Rapid City and not a far drive to Rushmore and Crazy Horse..
Ellsworth continues to be a nice place to stay with friendly staff and nice sites. 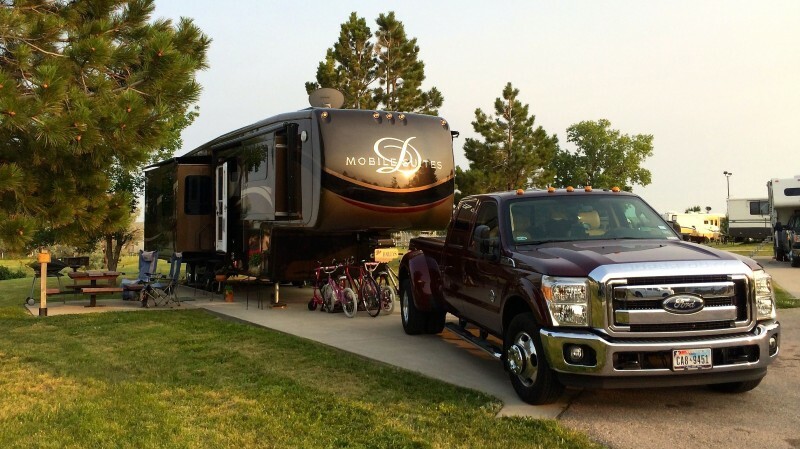 We are a 45 foot motorhome towing a truck so we prefer the new sites which are long enough to fit the motorhome AND the truck with room to spare. Also, I like the utility setup at the new sites versus the old. In addition, some of the hookups in the older area are not lined up well and you have to stretch your sewer hose or water to fit. Last summer when we were here, we were in the old side and the lawn care company managed to rip through my sewer hose with their weed wacker. Does not happen on the new sites. The sites are concrete. We usually come in the patriot gate (M-F: closed on weekends) or the main gate, but this time as we approached there was a sign that said vehicles over 25' should use the commercial gate (Ellsworth St.) Current rates vary by time of year: 1 NOV-30APR = $10 (electric only) 1 MAY-31 JUNE = $23 FHU 1JULY-30 OCT = $28 FHU washers and dryers continue to be free. 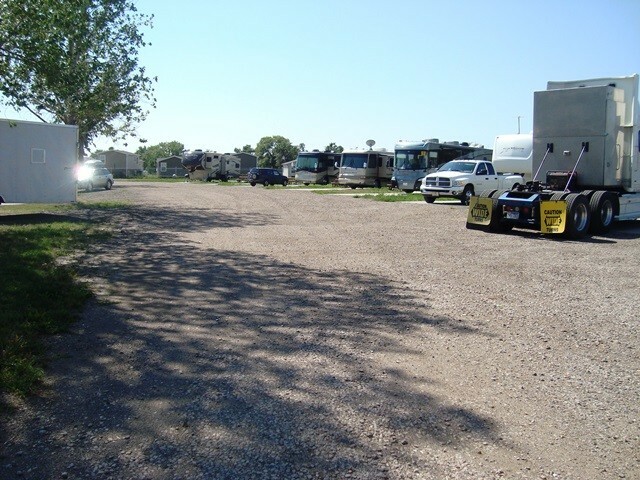 Used 2 full-hook up pull-through sites for 36' and 30' travel trailers. The sites are on concrete and the only leveling required was from the front hitch (front to back). The picnic tables are a touch small and anchored to the ground - we had 8 people trying to sit and that left very little room for the plates on the table. There are no fire circles due to the general fire risk of the area. The grass between the sites needed to be mowed on the day we arrived and they weren't mowed until 6/8 and the thistles were a bit out of control by then. The restrooms were really nice with free showers and free laundry! We took the advice provided on this site and left our awnings in...GREAT advice as the wind does randomly gust 25+ without warning. 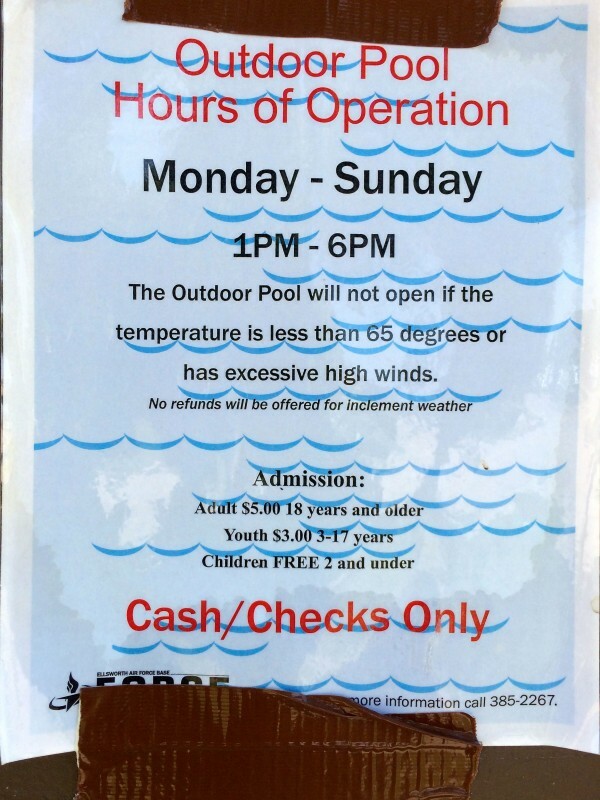 The indoor pool is just a lap pool and the outdoor pool is out of service for the 2018 season. (Reminder to wear full/proper coverage in the fitness building - my daughter (13) just wore shorts over her one piece swim suit and received some eye glares...oops.) We rented 2 bikes from the Outdoor Rec for $10 each. The bikes were nice, until the one ended up with a flat tire 1 hour into the use. You are REQUIRED to wear a helmet on Base, no reflector belts required. 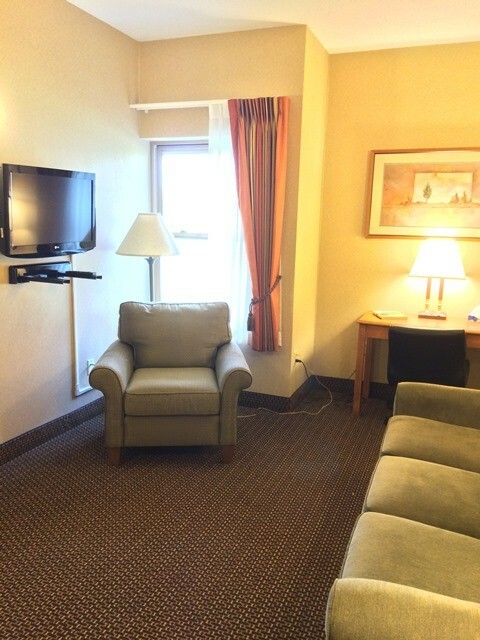 The location is great for the tourist areas as everything is about a 1 hour drive. The "closer" campgrounds to the attractions are not nearly as nice. WIFI at night was super spotty, which was nice to have teenagers engaged in the people around them as opposed to working their thumbs! Couple other points: a) The Main Gate weave around the concrete blockades are a bit tight, so caution. b) The other gates close early. 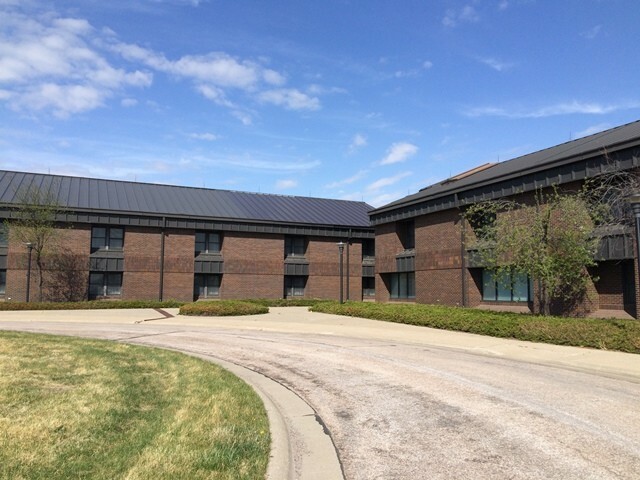 c) Safety shelter is located at the Special Forces building, which is a block+ away from the camp. d) The PX/BX has very odd hours as does the Base in general, so watch times. Great Fam Camp.We extended our stay with no problems.Great folks working in the office. Sites are long, level with easy hookups. In the area furthest from the check in office,WiFi was iffy,sometimes worked good, most time it wouldn't connect or disconnected continuously. Nasty storms a couple days we were there and they would call to warn us and tell us where to go if we needed to evacuate. One evening the police came to warn of potential storms. They definitely have it together here. Free laundry with no issue with hot water as previous poster stated. showers and bathhouse clean.Plenty to do in the area to keep you busy for days. No complaints at all. The hot water issue in the laundry / bath house has been resolved. Home sweet home! 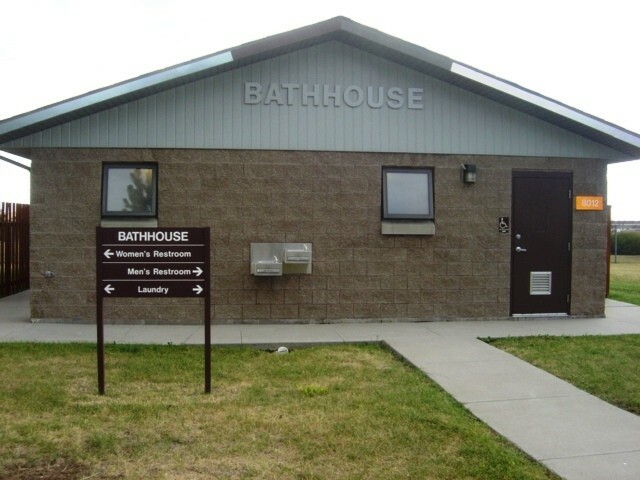 Just a heads up: the hot water is out at the bath house and laundry facility. We'll be here a couple of weeks, so I'll let y'all know when it's back. There are also some pad replacements going on, and the roads are in a little of a bumby mess. But, the wi-fi is smokin'! I didn't have problems encountered by the last two reviewers. Maybe it was because we only stayed for a couple of days. We got there after hours and the camp host was helpful and friendly. She informed us that there was no vehicle washing and we needed to run the washers in express mode because the regular mode was very time consuming and limited use for others. 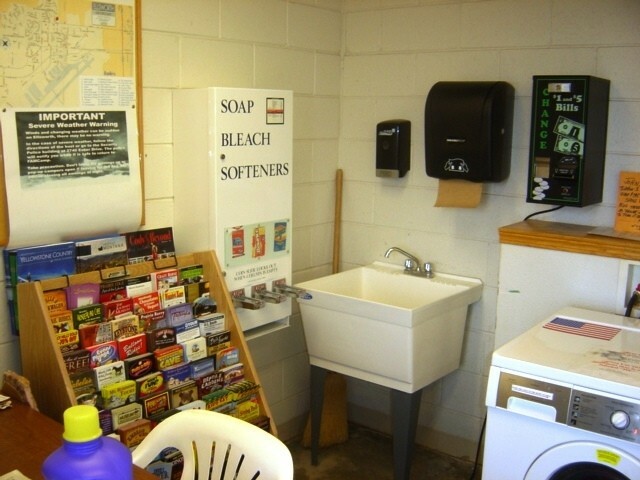 The laundry room and bathrooms were clean and well stocked. It is the perfect place to stay if you want to visit the Black Hills, Deadwood, Sturgis, Mount Rushmore, etc. We stayed at Ellsworth this past September for a week and toured Rushmore. 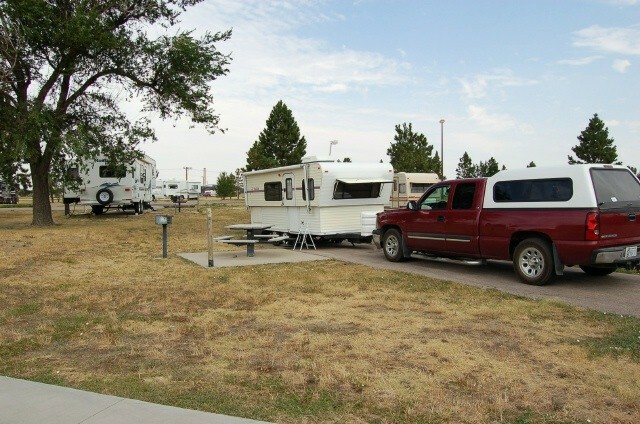 The RV Park was nice but the Camp Host lacked experience in keeping the Park clean and informing guest of issues. One night the power was out and did not find out until we woke the next morning. The Host never bothered to inform the guest of the planned power outage. When I questioned them they said they had a sign at the office on the wall. So, IF you had a reason to go to the office you might find out. This was poor performance on the park directors part because he/she should manage these people. these Hosts are just getting a free spot. Laundry room is just OK but needs cleaning. Also put signs in the room to reflect the washer will take 90 min, not 30. Host just drive around in a cart and put cones in empty spots. They could be a 10 park but need new host to get there. The Base however is beautiful and lots to see and do. The Air Museum outside the base is a must see. Rushmore was breathtaking. Great location for the local sites. Rushmore, Badlands, Deadwood, Black Hills, etc. Two weeks was about a week too long. 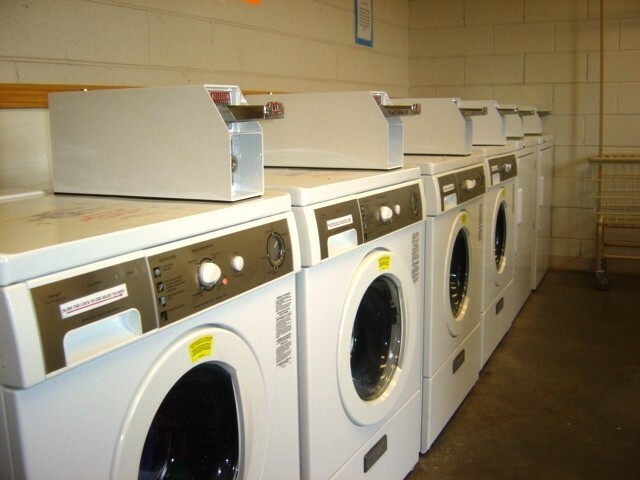 Free washer dryers cost us an afternoon of time due to the length of the the wash cycles??? But it was FREE. On the negative side we were told no vehicle washing yet I observed 2 sites that had leaking water outlets that leaked continuously for two weeks. I reported the sites and finally saw one repaired the day before we left. Enough water was wasted to wash every vehicle in the park. Never did see any grass cut while we were there, and it was high upon arrival. I just don't know what is done with the $28 a day collected. Much more could be put into the park. Having said all that, it was a pleasant park to stay at and the camp host was very nice and helpful. Base facilities were close by and adequate. Be prepared for LOTS of wind! Otherwise this is a superb CG. The host at the CG is professional, friendly and extremely helpful. Rapid Falls has anything you could possibly need, the Commissary and Exchange are nearby and the Express is a block away - and sells diesel! There's an Auto Hobby Shop within a mile where I was able to change the oil in my diesel truck. Also was able to get a new tire for our trailer (picked up a glass shard in a tire that already had a plug) at a great price there. Made a day trip to Rushmore, Crazy Horse and return for just a little over 100 miles. 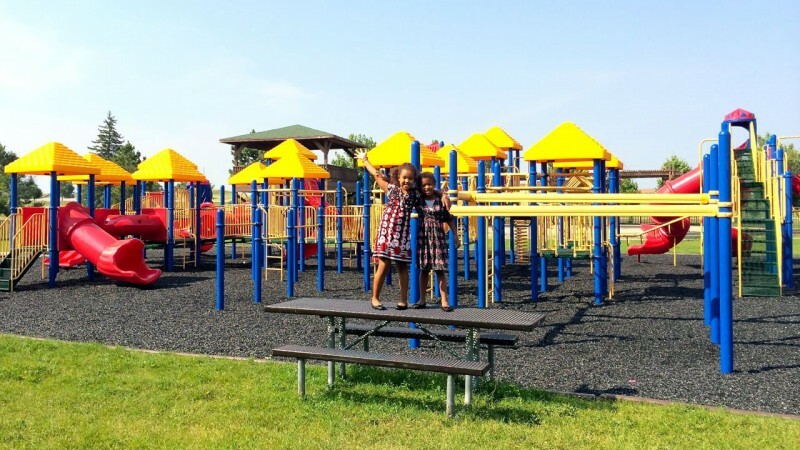 We have stayed in military campgrounds from coast to coast and this one is near the top of our list. Perfect location with access to many historical sites, state and national parks. The FamCamp is clean, level sites, free laundry, WiFi that actually works, wide spots spaced apart from your neighbor, friendly staff and camp hosts. The Exchange, Commissary and Express are smaller but adequate. Military clothing is in the Exchange. There is a separate store by the food court for home/garden. The Express (base gas station or shop-ette, depending on how "old school" you are) actually has diesel and it is about one block from the FamCamp!! 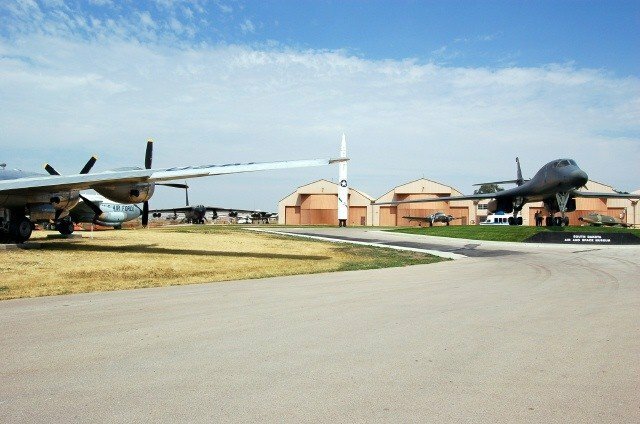 Make sure you visit the base museum and take the missile silo tour where you get to go down in the silo.